According to the Hindu religion, marriages are considered a sacred affair. Marriages are not just about a lifelong affair, it is a relationship that is supposed to last for the next seven lives. Hindu marriages are a long drawn affair, where there are a dozen (& sometimes more) auspicious rituals & ceremonies which have to be followed. And, it is not only the bride and groom who have to be there, the whole troupe of family members & close relatives have to take part & shower their blessings on the happy couple. 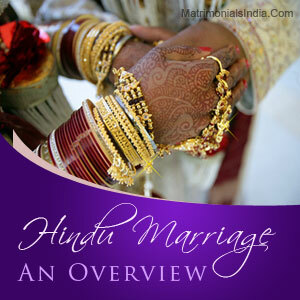 Within Hindu Marriages too, there are a lot of variations depending upon the state and ethnicity of the couple. Though there may be some unique customs & rituals specific to certain regions, there are some common ceremonies & rituals which are universally followed. The Hindu weddings are solemnized by a Hindu priest who performs all the rituals, etc. in the proper manner. In a typical Hindu marriage, the astrological charts are consulted in order to find an auspicious day & time for solemnizing the marriage. As per the Hindu belief, this ensures that the couple is blessed with a happy married life. The couple is made to sit in front of the holy fire which signifies the sacredness of the relationship. The sacred fire is also believed to be a witness to the holy union. Another thing which is common to all type of Hindu marriages includes the part where the groom smears the forehead of the bride with Sindur (red powder). The red color is considered auspicious according to Hindu belief. The groom also ties a Mangalsutra (a sacred thread) around the bride's neck. Together, i.e. the Mangalsutra & the Sindur are considered the mark of a married Hindu woman. The couple takes seven rounds around the holy fire (called the Saat Pheras). Each of the pheras stand for different vows, seven in total. The ceremonies mentioned above are just a few of the ones actually followed. There are many other small & big rituals (which are considered essential) in order for the Hindu marriage to be considered complete.